I’ve never yet read a Marian Keyes book which I didn’t enjoy, and I have read them all. The Break is no exception and proves once again that she is an expert at blending family drama with humour. Following the death of his father and a close friend, Hugh shocks his family by announcing that he is taking a six month break from his marriage and heading off on a trip to ‘find himself’. It’s a typical mid-life crisis but a bit more serious than splashing out on a fancy car. His wife Amy is so hurt and angry but has no choice other than to adapt to life without him. With a family of three girls and a busy job as a publicist which involves being in London two days every week, she soon realises just how much of a unit she and Hugh were and resents his leaving her in the lurch. Her anger and sadness isn’t helped when she sees photos of him looking happy and relaxed on South East Asian beaches in his Facebook feed. Though Hugh is having a break and leaving all his responsibilities behind, Amy doesn’t have that choice. But if he is on a break, then does she have the opportunity to have a break from their marriage too? This book has all the elements I love in a Marian Keyes book. There are times it will make you sad but there are times it will make you laugh out loud, particularly with the supporting cast of a large and eccentric Irish family. She writes so well about all the different kinds of challenges that a modern family can face: aging parents, challenging teens, marriage difficulties, temptations, second chances, choices to be made, friendship issues. There is also sexual tension simmering throughout the book as Amy recalls a flirtation with a colleague and revisits the idea of acting upon it. The Break is witty, warm and wise and a hugely enjoyable read. Marian Keyes is such a wonderful storyteller that I just get completed wrapped up in her books. I had no idea which way the story would go, and I didn’t actually know how I wanted things to resolve for Amy, but as always, the author got the ending just prefect for all her characters. 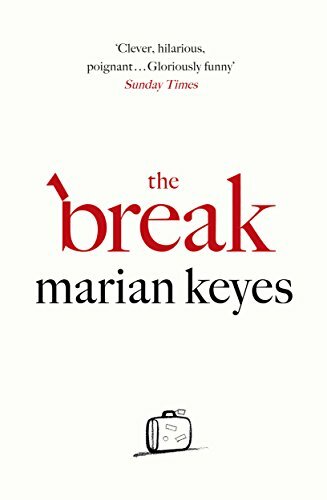 The Break sees Marian Keyes at her brilliant best and will not disappoint her many fans. netgalley, huh? i’m going to have to look that one up! thanks for a great review! Love Marian! Look forward to this one. Sounds great – can’t wait!